Carrots are the second most popular vegetable after potatoes. 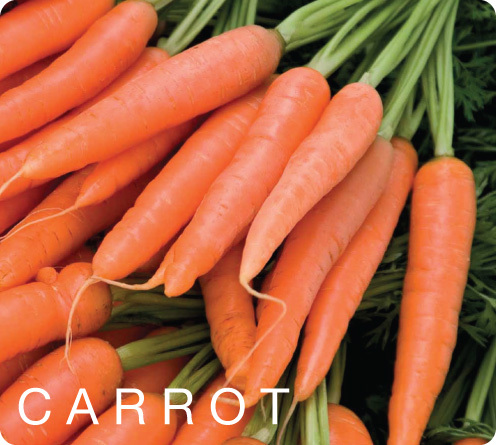 Carrots are rich in vitamin A, and are good sources of vitamin B1, vitamin B2, vitamin B6, vitamin K, biotin, fiber, potassium and thiamine. Vitamin A improves vision, as it is necessary for the retina; it also prevents premature wrinkling, acne, dry skin, pigmentation, blemishes, and uneven skin tone. Among other health benefits attributed to carrots are: antiseptic; anti-aging; cleansing properties, which make them good for your dental health, they act as natural abrasives that help in eliminating dirt and plague from the teeth and gums; as well as detoxifying your liver. They are also considered suitable for preventing lung cancer, breast cancer and colon cancer, heart diseases and strokes.